Partner Leo Dombrowski was recently featured in the Chicago Daily Law Bulletin. 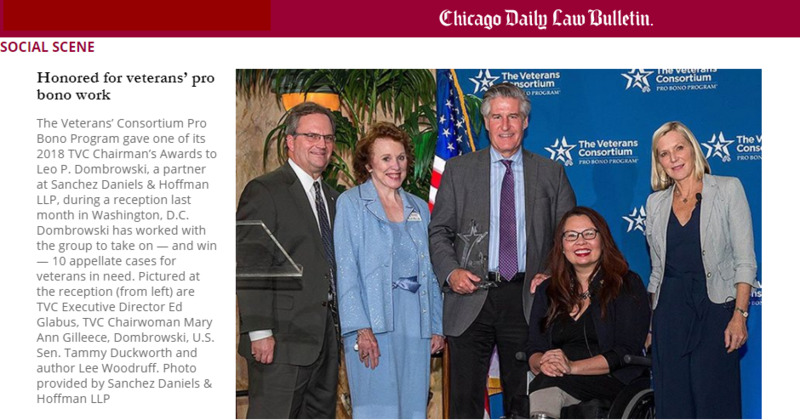 Leo was recognized with an award from The Veterans Consortium Pro Bono Program presented to him by Senator Tammy Duckworth at a ceremony at Union Station in Washington, DC in October. The Veterans Consortium Pro Bono Program is a Washington, DC-based non-profit that connects attorneys with veterans appealing the denial of VA benefits to the U.S. Court of Appeals for Veterans Claims. Leo has been involved with The Veterans Consortium for 20 years.